If you have a wet basement, moldy crawl space or settling foundation you need an effective solution from a company whose expertise, reliability, and workmanship is second-to- none. That's exactly what you will get with us. Have questions? Just let us know and we will be happy to explain what is wrong and how we will fix it ... we are here to help. If you are dealing with basement, crawl space or foundation problems and live in Burlington, Claremont, Brattleboro, Keene or nearby give us a call. Get a faster, affordable alternative to repair your concrete slab. 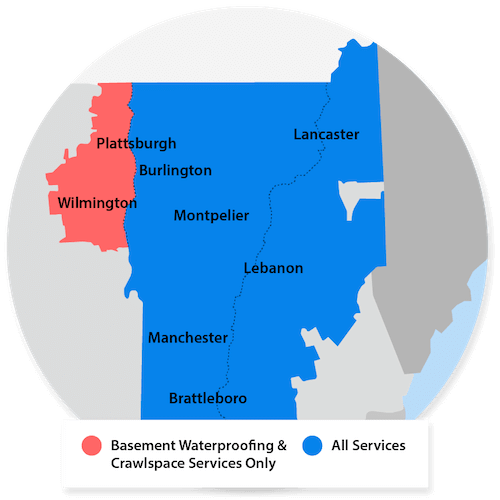 Northern Basement Systems is the leading basement waterproofing, crawl space moisture control, and foundation repair contractor in Vermont and New Hampshire. We are accredited with the Better Business Bureau and maintain a consistent A+ rating. We offer quality basement & foundation work while providing outstanding service to each and every one of our customers. We are proud to be the exclusive Basement Systems and Supportworks dealer for Vermont and New Hampshire, delivering expert solutions and continued service to our valued customers. Northern Basement Systems services all of Vermont and New Hampshire including: Laconia, Burlington, Keene, Barre, Colchester, Brattleboro, Bennington, South Burlington, Montpelier, Saint Albans (St Albans), Concord, Claremont, Milton, Berlin, Middlebury and surrounding areas. Whether you're building a new home or you already have a home with a wet basement, the certified trained professionals at our company offer a full range of patented products at an affordable price that can help you fix your problem.